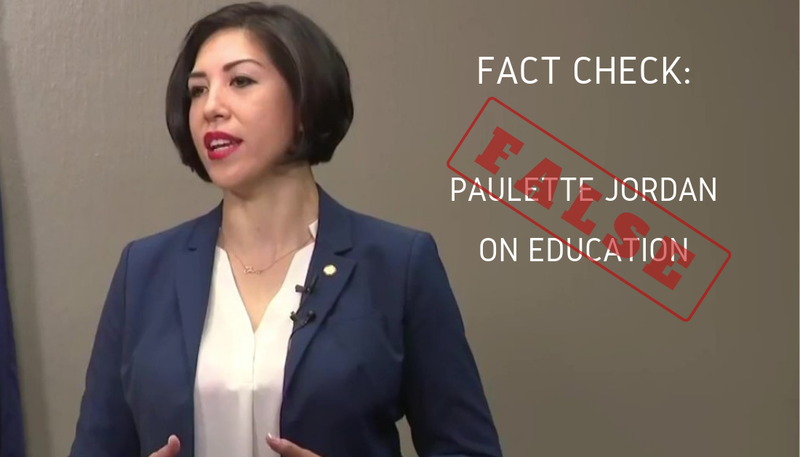 Home » News » Paulette Jordan Fact Check: Democrat’s Claim that Idaho is “Categorically Last” in Education is Categorically False. Paulette Jordan Fact Check: Democrat’s Claim that Idaho is “Categorically Last” in Education is Categorically False. In the KBOI 2-TV/670 KBOI Radio gubernatorial debate today, Democrat Paulette Jordan made several statements that don’t square with the facts. Idaho ranks 6th in the nation for largest year-to-year increase in K-12 funding. Idaho ranks 16th in the nation for percentage of total spending on K-12 schools. Idaho ranks 2nd in the nation for percentage increase in number of teachers & instructional staff. Idaho ranks 8th in the nation for percentage increase in average teacher salary and 17th in the nation for percentage increase in average instructional staff salary. The National Education Association estimates that for 2017-18, Idaho ranks 1st in the nation by far for percentage increase in number of teachers & instructional staff (see pp. 47-48 of linked document). The NEA also estimates that for 2017-18, Idaho ranks 1st in the nation for percentage increase in average teacher & instructional staff salaries (see pp. 49-50, third column, of linked document). Thanks to the multi-year effort by the Legislature and Governor to dramatically increase funding for public schools (at least $100 million in new schools funding for the past four years), Idaho is trending upwards in many categories. Idaho taxpayers have been, and continue to be, incredibly generous in boosting funding for our students and teachers. Paulette Jordan doesn’t seem to understand or acknowledge that fact. October 13, 2018 / In Elections, News / By Idaho GOP / Comments Off on Paulette Jordan Fact Check: Democrat’s Claim that Idaho is “Categorically Last” in Education is Categorically False.